Figure A. RPE conjugated Mouse anti Human CD11c (MCA2087PE) and FITC conjugated Mouse IgG2a isotype control (MCA929F). Figure B. RPE conjugated Mouse anti Human CD11c (MCA2087PE) and FITC conjugated Mouse anti Human HLA DP/DQ/DR (MCA477F). All experiments performed on human Peripheral blood mononuclear cells in the presence of human SeroBlock (BUF070A). 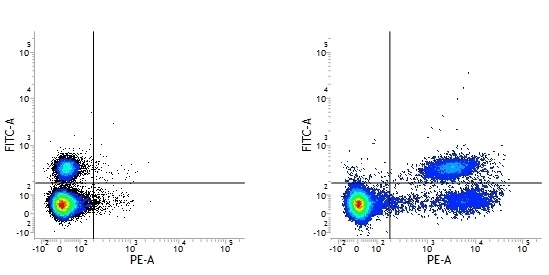 Figure A. FITC conjugated Mouse anti Human CD86 (MCA1118F) and RPE conjugated Mouse IgG2a isotype control (MCA929PE)> Figure B. FITC conjugated Mouse anti Human CD86 (MCA1118F) and RPE conjugated Mouse anti Human HLA DP/DQ/DR (MCA477PE). All experiments performed on human Peripheral blood mononuclear cells in the presence of human SeroBlock (BUF070A). Mouse anti Human HLA DP DQ DR antibody, clone WR18 used for the evaluation of MHC class II expression on dendritic cells by flow cytometry. Time course of DC differentiation from H1 hESC. Cells were harvested from cultures at various time points and analysed by flow cytometry for the onset of hematopoiesis and the appearance of DC. (a) Cells harvested at day 20 of culture showing expressing of CD45 but lack of myeloid commitment, as evidenced by staining for CD13, CD14, and CD11c. Open histograms show levels of background staining using isotype-matched control antibodies. (b) Appearance of CD45int cells at day 27 of culture, accompanied by the upregulation of myeloid-specific markers. (c) Photomicrograph, taken at day 28 of culture, showing the morphology of DC, including veils of cytoplasm and long dendrites (inset) (×40 magnification). (d) Cells harvested at day 33 of culture, showing the appearance of a CD45hi population containing predominantly DC progenitors expressing CD14, CD11c, CD86 and MHC class I. (e) Phenotype of immature and mature H1-DCs compared with human moDC. DCs were cultured either in medium alone or medium supplemented with the maturation cocktail and stained for MHC class II, the maturation marker CD83 and classical costimulatory molecules. Dead cells were excluded from the analysis using 7-AAD. Dashed histograms show the phenotype of immature DCs while the filled histograms represent mature DCs. Open histograms depict background staining using isotype-matched controls. Journal of Biomedicine and Biotechnology, vol. 2012, Article ID 172420, 11 pages, 2012. 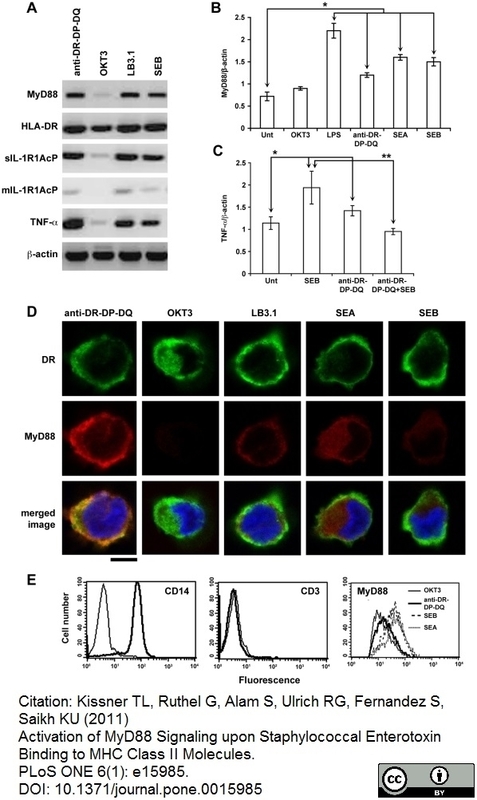 Ligand engagement of HLA class II molecules up regulates MyD88, IL-1R1, and TNF-α in CD14+ human monocytes treated with SEB, SEA, or mAb directed against MHC-class II molecules. (A) Transcriptional activation of MyD88, IL-1R1AcP and TNF-α in HLA-DR positive primary monocytes treated with 200 ng SEB/ml (optimum dose), mAbs (10 µg/ml, optimum dose) directed against MHC-class II molecule (anti-DR-DP-DQ or LB3.1) or unrelated control antibody OKT3 was examined by semi-quantitative RT-PCR. Data shown is one of 3 similar experiments; (B) Agonists binding to TLR4 or HLA class II molecules on CD14+ monocytes induced transcriptional up regulation of MyD88. Real time RT-PCR was used to determine relative expression of MyD88 normalized to the expression of β-actin. Expression levels are determined as means +/− SD. Data presented as one of 3 similar experiments. Significance compared to untreated control (*) was assigned as P≤0.0001. (C) MHC class II molecule dependence of SEB- induced TNF- α gene expression. Pretreatment of monocytes in ice with anti-DR-DP-DQ at optimum dose (10 µg/ml) followed by SEB stimulation resulted in reduced TNF- α gene expression. Transcriptional activation of TNF- α expression normalized to the expression of β-actin. Expression levels of TNF- α are expressed as means +/− SD. Significance was assigned (*) or (**) as P values ≤0.003 comparing untreated vs treatment groups with anti-DR-DP-DQ, SEB or SEB vs anti-DR-DP-DQ+SEB respectively. (D) Confocal images show expression of HLA-DR (green) and intracellular MyD88 (red) proteins in CD14+ monocytes treated with HLA class II- ligands or control antibody OKT3 for 16 h; Scale bar = 5 µm; (E) intracellular expression of MyD88 protein in activated monocytes. 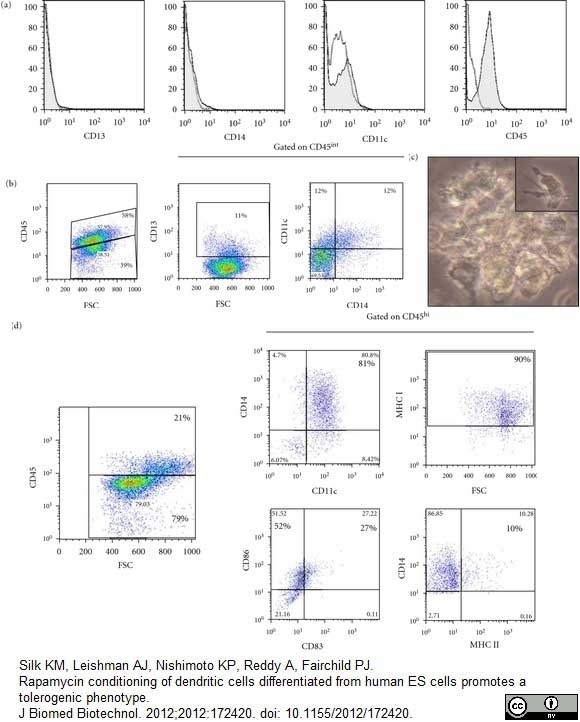 Primary monocytes (CD14+, CD3-) were activated as described earlier, permeabilized and labeled with primary MyD88 antibody followed by PE-labeled secondary antibody and analyzed by flow cytometry. Histogram represents a MHC class II ligand-induced increase in expression of MyD88 protein compared to non-MHC class II ligand (OKT3). From: Kissner TL, Ruthel G, Alam S, Ulrich RG, Fernandez S, et al. (2011) Activation of MyD88 Signaling upon Staphylococcal Enterotoxin Binding to MHC Class II Molecules. Mouse anti Human HLA DP DQ DR antibody, clone WR18 used for the evaluation of HLA DR expression on dendritic cells by flow cytometry. 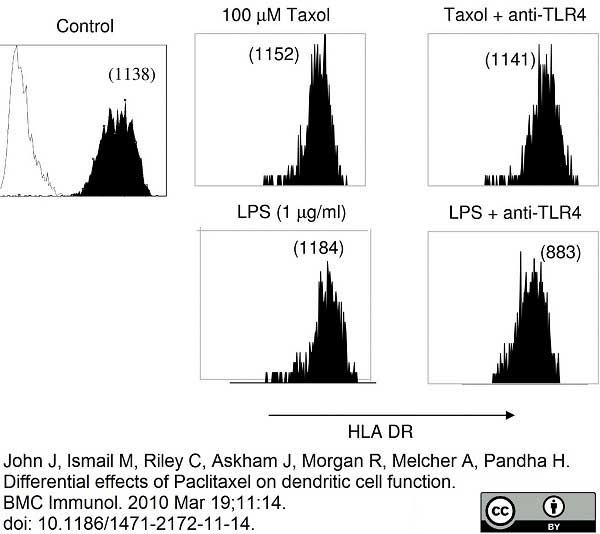 Upregulation of DC class II expression by paclitaxel is not mediated via TLR-4. DC were cultured for 2 h with LPS or paclitaxel in the presence or absence of anti-TLR-4 Abs prior to washing and reculture for a further 24 h. Anti-TLR4 antibody did reduce class II expression after exposure to LPS, but not to paclitaxel at high dose. Numbers in parenthesis represent MFI of class II detection. Data is representative of 3 independent experiments from 3 donors. From: John J, Ismail M, Riley C, Askham J, Morgan R, Melcher A, Pandha H. Differential effects of Paclitaxel on dendritic cell function. BMC Immunol. 2010 Mar 19;11:14. Inhibition of proliferation by anti-MHC class II antibody. Mononuclear cells from cord blood (■) or adult PBMC (□) were preincubated with MAb MCA477, and assays of proliferation to different antigens were carried out. Inhibition was expressed as the SI for treated cells compared to that for untreated cells, which was normalized to 100%. Each bar represents the mean and standard deviation from three assays. From: Chia JS, You CM, Hu CY, Chiang BL, Chen JY. Human T-cell responses to the glucosyltransferases of Streptococcus mutans. Clin Diagn Lab Immunol. 2001 Mar;8(2):441-5. Mouse anti Human HLA DP DQ DR antibody, clone WR18 reacts with a monomorphic determinant common to DP, DQ and DR beta chains, which are expressed by antigen presenting cells, B cells, monocytes and activated T lymphocytes. Human HLA Class II (DP, DQ, DR). Spleen cells from immunised BALB/c mice were fused with cells from NS0 mouse myeloma cell line. 1 This product contains sodium azide, removal by dialysis is recommended prior to use in functional assays. Bio-Rad recommend the use of EQU003 for this purpose. 2This product requires antigen retrieval using heat treatment prior to staining of paraffin sections.Sodium citrate buffer pH 6.0 is recommended for this purpose. Moore, K. et al. (1987) Use of the monoclonal antibody WR17, identifying the CD37 gp40-45 Kd antigen complex, in the diagnosis of B-lymphoid malignancy. Kissner, T.L. et al. (2011) Activation of MyD88 Signaling upon Staphylococcal Enterotoxin Binding to MHC Class II Molecules. Chia, J.S. et al. 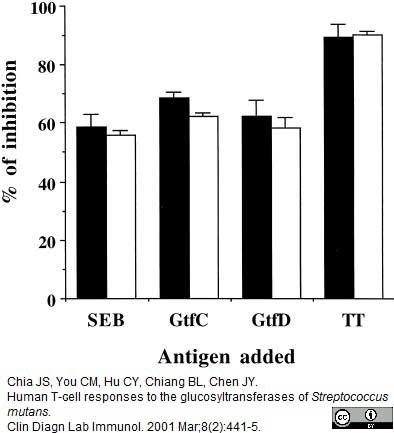 (2001) Human T-cell responses to the glucosyltransferases of Streptococcus mutans. Clin Diagn Lab Immunol. 8: 441-5. Chang, Y.C. et al. (2008) Epigenetic control of MHC class II expression in tumor-associated macrophages by decoy receptor 3. Litzinger, M.T. et al. (2009) Chronic lymphocytic leukemia (CLL) cells genetically modified to express B7-1, ICAM-1, and LFA-3 confer APC capacity to T cells from CLL patients. Cancer Immunol Immunother. 58: 955-65. Sadallah, S. et al. (2011) Microparticles (ectosomes) shed by stored human platelets downregulate macrophages and modify the development of dendritic cells. Sabbah, S. et al. (2012) T-cell immunity to Kaposi sarcoma-associated herpesvirus: recognition of primary effusion lymphoma by LANA-specific CD4+ T cells. John, J. et al. (2010) Differential effects of Paclitaxel on dendritic cell function. Palmer, K.J. et al. (2000) Interferon-alpha (IFN-alpha) stimulates anti-melanoma cytotoxic T lymphocyte (CTL) generation in mixed lymphocyte tumour cultures (MLTC). Clin Exp Immunol. 119: 412-8. Silk, K.M. et al. (2012) Rapamycin conditioning of dendritic cells differentiated from human ES cells promotes a tolerogenic phenotype. J Biomed Biotechnol. 2012: 172420. Elias, F. et al. (2003) Strong cytosine-guanosine-independent immunostimulation in humans and other primates by synthetic oligodeoxynucleotides with PyNTTTTGT motifs. Silk, K.M. et al. (2012) Cross-presentation of tumour antigens by human induced pluripotent stem cell-derived CD141(+)XCR1+ dendritic cells. Gene Ther. 19 (10): 1035-40.
del Pilar Martin, M. et al. (2008) Decrease in the numbers of dendritic cells and CD4+ T cells in cerebral perivascular spaces due to natalizumab. Keating, S. et al. (2002) The lytic cycle of Epstein-Barr virus is associated with decreased expression of cell surface major histocompatibility complex class I and class II molecules. Trefzer, U. et al. (2000) Hybrid cell vaccination for cancer immune therapy: first clinical trial with metastatic melanoma. Int J Cancer. 85 (5): 618-26. Hayman, M.W. et al. (2006) Soluble human leukocyte antigen: a diagnostic indicator of rheumatoid arthritis? J Immunol Methods. 315 (1-2): 19-26. Manna, D. et al. (2012) WR18 MONOCLONAL ANTIBODY: A SINGLE ANTIBODY TO DETECT HLA DR, DP AND DQ ANTIGENS. Neumann, F. et al. (2004) Identification of an antigenic peptide derived from the cancer-testis antigen NY-ESO-1 binding to a broad range of HLA-DR subtypes. Cancer Immunol Immunother. 53 (7): 589-99. Neumann F et al. (2004) Identification of an HLA-DR-restricted peptide epitope with a promiscuous binding pattern derived from the cancer testis antigen HOM-MEL-40/SSX2. Int J Cancer. 112 (4): 661-8. Iking-Konert C et al. (2005) Transdifferentiation of polymorphonuclear neutrophils to dendritic-like cells at the site of inflammation in rheumatoid arthritis: evidence for activation by T cells. Ann Rheum Dis. 64 (10): 1436-42. Hönger, G. et al. (2015) Inter-individual differences in HLA expression can impact the CDC crossmatch. Tissue Antigens. 85 (4): 260-6. Arch Neurol. 65 (12): 1596-603. Noble, P. et al. (2013) High levels of cleaved caspase-3 in colorectal tumour stroma predict good survival. Br J Cancer. 108 (10): 2097-105. Llewelyn, M. et al. (2004) HLA class II polymorphisms determine responses to bacterial superantigens. J Immunol. 172 (3): 1719-26. Koschwanez, H. et al. (2015) Stress-related changes to immune cells in the skin prior to wounding may impair subsequent healing. Brain Behav Immun. 50: 47-51.